Echoes From Then is a limited edition companion volume to Bathed In Lightning: John McLaughlin, the 60s and the Emerald Beyond (Jawbone Press, 2014), self-published in conjunction with Market Square Music. It contains a substantially revised version of the bonus content exclusive to the e-book edition of Bathed In Lightning along with many new chapters based on recent research. 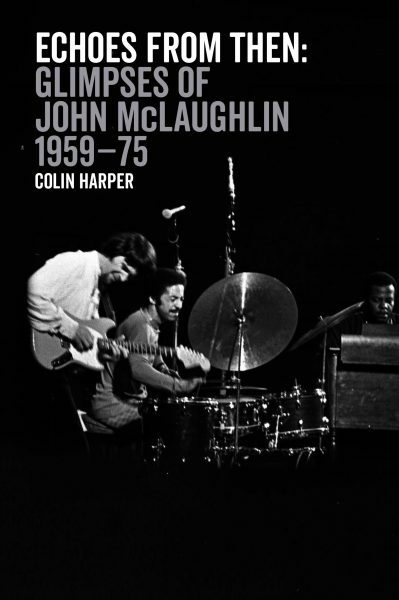 In short: 176,000 words, 16 glossy pages of rare photos and a further 80 pages of period adverts relevant to John McLaughlin’s path through ‘60s Britain to the Mahavishnu Orchestra in New York. Highlights of Echoes From Then include: revelatory new chapters on John’s time with Big Pete Deuchar & His Professors of Ragtime (1959–60) and the Tony Meehan Combo (1963–64); a look at probably the world’s first John McLaughlin interview, from The Wandsworth Advertiser in March 1963; an investigation into John’s ‘60s recordings with Georgie Fame; the beginnings of Graham Bond’s Quartet in 1963; Arjen Gorter’s recollections of Gunter Hampel’s Time Is Now (1968); period coverage of the release of Duffy Power’s Innovations (1971); an audience with Gene Perla, the ‘Pete Best’ of the Mahavishnu Orchestra; four chapters on the adventures of the second Mahavishnu Orchestra on the road (1974–75); and four forensic appendices covering John’s British recording and broadcasting sessions 1963–69, his US recording sessions 1969–75, his known British concert appearances from 1963–68, and the second Mahavishnu Orchestra’s concert appearances 1974–75 (all newly updated and expanded). Echoes From Then also includes licensed period content from four great British music writers of the 70s: Jerry Gilbert, Hugh Fielder, Andrew Means, Charles Shaar Murray and Richard Williams. Photos include rare or previously unpublished images from Christian Rose (France), Bill Smith (Canada), Jak Kilby (UK) and Michael Parrish (USA) and rare publicity shots of John with Herbie Goins and with Big Pete Deuchar, along with some images repeated in larger scale or in colour from Bathed In Lightning. As with Bathed in Lightning, the design of the new book is by Mark Case and typesetting by Tom Seabrook. The initial print run is 200 copies. If there is genuine demand I will have another 100 printed – but if you want a copy, don’t prevaricate too long!